Celery and celeriac (Latin name: Apium graveolens var.) are in the same botanical family as anise, parsley, parsnips, and carrots. Celeriac is called (der) "Sellerie" in German and is the root (like a carrot) of the plant. Celeriac is also widely known as "celery root" and also called "turnip-rooted celery" or "knob celery". This root vegetable grows wild in the Mediterranean basin and in northern Europe but is cultivated on other continents. Celeriac became important in European cuisine in the 1600s and is most famous for the French dish "Celeri Remoulade" which is a salad of raw, grated celeriac in a mustard mayonnaise. It is also used in German "Suppengrün", a mix of vegetables used to make soup stock, where it is used as a herb. Unfortunately labeled by many a very ugly vegetable, when pulled out the ground, the root itself is bumpy and brown. However, when peeled, the root beneath is revealed to be smooth and white. 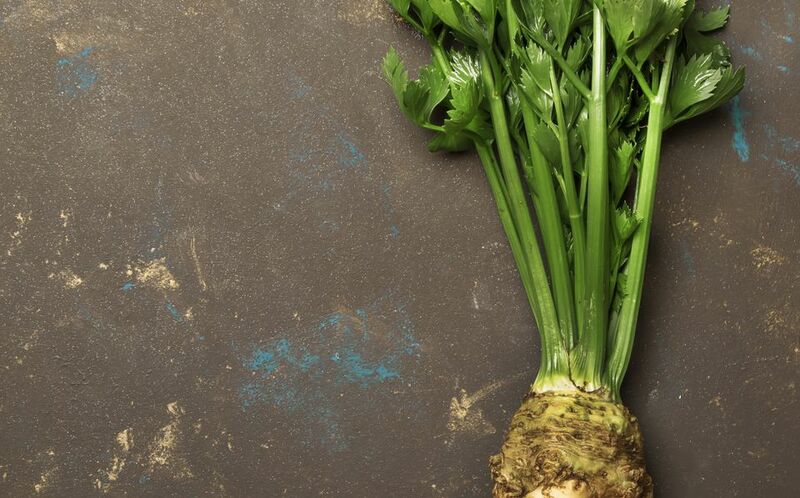 Celeriac has a mild celery and parsley taste and can be eaten raw and cooked. The white interior is then chopped and boiled, sautéed or grated. One extremely popular way celeriac is used, particularly for people who are watching their calorie or carbohydrate intake, is to substitute celery root for potatoes. Serving the root mashed with a small amount of butter or cream. Celery root only has 60 calories per cup. You can also use the green stalks that grow out of the top of the root to flavor soup stocks and stews. However, be aware the green stalks are fibrous, hollow and not as pleasing to the palate as American celery. If you cannot find celeriac in the market for recipes, you may substitute American celery or a "bouquet garni" (tied herbs) of celery leaves and parsley. Celeriac is popular in Germany cuisine, much more popular than in the United States. In Germany, celery root is used in everything from soups to schnitzels. The root can be roasted, boiled, steamed, creamed and even grated raw over salads. The stalks of the celery root, chopped very small, can be substituted in many recipes calling for celery. Some American recipes calling for fresh celery (Ants on a Log, Waldorf Salad) will not work as well with celeriac.